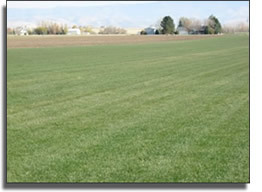 We've grown a five variety seed mixture turf specifically formulated for our Intermountain West climate. Our product is perfect for our unique watering and growing needs. Our sod is a Kentucky blue grass mixture chosen for its lush, dark green color. It is a hardy, but fine textured grass that is disease resistant and drought tolerable. With minimal maintenance it will provide a lifetime of enjoyment and beauty for your property. Need assistance or have a question? We're happy to assist you. Please complete the form below and we will contact you with an answer.